The power is on: Juan Soto (Nats), Jorge Mateo (A's) and Bobby Bradley (Indians) -- all are top-four prospects in their respective systems, and all enjoyed a two-homer game Thursday. Read all about 'em: Soto, Mateo, Bradley. 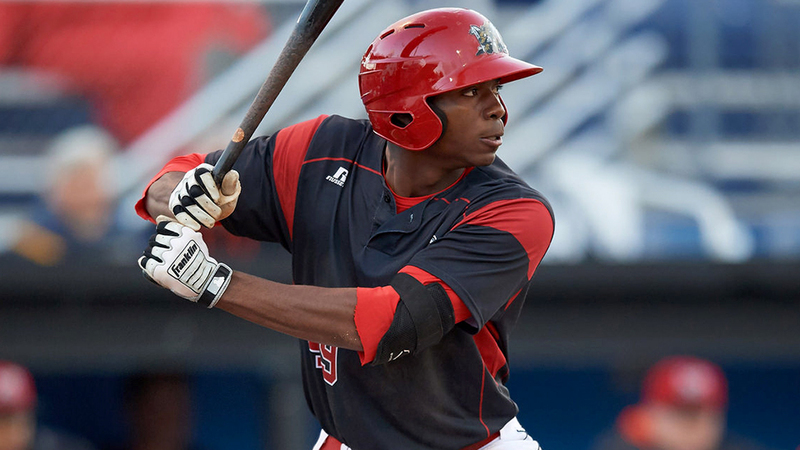 Marlins OF Thomas Jones, Class A Greensboro: 2-for-4, 2 HR, 2 RBI, 2 R -- The 2016 third-rounder finally made his Class A debut Wednesday. Since then, all he's done is go 4-for-8 with three homers and five RBIs in two games. That's one more long ball than he had over 68 games last season with Class A Short Season Batavia. The Marlins gave Jones a $1 million signing bonus two years ago to walk away from a football scholarship at Vanderbilt because of his raw athletic nature, but that didn't translate at the plate last season. Known primarily for his plus-plus speed, Jones hit .181/.315/.282 during his summer in the New York-Penn League, and that performance dropped him to the No. 25 prospect spot in an improving Miami system. This could just be a two-game power surge, but if it's a sign that Jones is prepared to put things together with the bat, he has the tools to give himself plenty of helium in 2018. Nationals SS/2B Yasel Antuna: 2-for-3, HR, RBI, 2 R, BB -- Washington was very high on its No. 7 prospect coming off his strong first stateside season in the Gulf Coast League, but it's taken some time for the 18-year-old infielder to transition to his first full-season affiliate. Antuna was 0-for-16 over four games entering Thursday, a run that had dropped his season slash line to .160/.233/.234 through 24 games. Thursday's effort represented his first multi-hit game since April 21 and brought his second homer of the year. Antuna was the second-youngest player on a South Atlantic League roster to start the season -- only teammate Luis Garcia was younger -- so a time of transition was always baked into the expectations for the Dominican Republic native. Athletics SS Jorge Mateo, Triple-A Nashville: 4-for-5, 2 HR, 3 RBI, 3 R, K, SB -- This received a full write-up from MiLB.com's Kelsie Heneghan -- as mentioned above -- but if anyone expected Mateo, a speedster who entered the day with a .165 average and .231 slugging percentage, to hit his first two homers Thursday in Colorado Springs, they should be spending their time and money in Pacific Coast League cities like Las Vegas or Reno. Kolby Allard vs. Austin Meadows: Two top-100 prospects ... one throwing from the left side ... the other batting from the left side ... both enjoying solid success over the first month of the season. This is what fun prospect matchups are made of. It almost got taken away from us when Meadows laid down a sacrifice bunt in the first inning. Luckily, the two crossed paths two more times Thursday night with Meadows reaching on an infield single in the third and flying out to center in the sixth. Allard finished with one of his best Triple-A starts yet, allowing one run on six hits and two walks over a season-best seven innings for Gwinnett. But it was Meadows and Indianapolis that had the last laugh when Erich Weiss hit a walk-off two-run double to give the Indians a 3-2 win in the ninth. Gwinnett and Indianapolis will see each other for a three-game set from May 29-31. Hopefully, if Allard and Meadows cross paths then, there will be more battles and fewer bunts. Blue Jays 3B Vladimir Guerrero Jr., Double-A New Hampshire: 2-for-5, HR, RBI, R -- The homer went viral rather quickly, as if the Blue Jays' top prospect needed any more hype in 2018. Guerrero crushed a 1-1 pitch from Binghamton right-handed starter Mickey Jannis and sent it screaming into the central New York night. Screaming is pretty accurate, actually. The sound upon contact was incredibly loud and spoke to the 19-year-old's growing power potential. Of course, the story of Guerrero's success in his first taste of Double-A is well-told at this point. After Thursday's show, MLB.com's No. 3 overall prospect is hitting .388/.452/.624 with three homers and a 10/12 K/BB ratio through 22 games. He has an extra-base hit in each of his last five contests and is riding a nine-game hitting streak. The way Guerrero continues to perform, the clearer it gets that even Double-A arms aren't presenting a challenge at this point. A slump could always be around the corner, but with every thunderous blast, Guerrero brings himself closer and closer to Triple-A. Cardinals RHP Dakota Hudson, Triple-A Memphis: 8 IP, 5 H, 1 R, 0 ER, 1 BB, 4 K, 89 pitches, 54 strikes -- The Cardinals' No. 6 prospect was rather efficient in his longest outing of the young season. With Jack Flaherty and Austin Gomber each getting brief promotions to the Majors early this season, Hudson needs to continue to pump out quality starts in Memphis if he's going to move up in the organizational depth chart. Cubs SS Zack Short, Double-A Tennessee: 2-for-5, 2 HR, 4 RBI, 2 R, K -- The Cubs' No. 22 prospect doubled his season home run output with the second two-homer game of his career. He's hitting just .190/.326/.392 in 21 games this season. Twins SS Royce Lewis, Class A Cedar Rapids: 2-for-3, RBI, R, BB, SB -- Last year's No. 1 overall pick was going to feature in Friday's Toolshed about prospects who fit the ready-for-promotion mold even before he reached base three times and stole his sixth base of the season. His line now stands at .354/.400/.415 through 16 games with the Kernels.